After what some will consider underwhelming recent results, the question might be should the Canadian Men's National team be beating Iceland with ease, opposed to losing out in a competitive series with a loss and a draw? You could spin this story in many ways. On the one hand you can add these outcomes to the ongoing embarrassment of a failed system who struggled against country that is even further north, has an overall population of less than 350,000 people, and less than half of the registered soccer players in Canada. However, on the other side you can say Canada was competitive with a country who are second in a European Championship qualification group, which has included a 3-0 win against Turkey and a 2-0 win against the Netherlands. The Icelandic league is actually one in my statistical and information business that I don't cover. I always wanted to, and think about it each year, but the reality is there are few players in the league who have much value in the soccer world. Being part of the European Union, most Icelandic soccer players who show any sign of potential join a team on the European mainland, and other than the national team, never really play soccer in Iceland. That being said, the league structure in Iceland has always been good. Their league is 104 years old, representing teams throughout the country. Attendance is a little less than an average of 1000 spectators per game, although you notice a real community with the league and a group of players who care less about being professional and more about having fun. This is demonstrated by this viral video of goal celebrations from the club team and current league champions Stjarnan. Outside of Canada, the other national program I follow closely is the Republic of Ireland. Being a supporter of such a small country, and an Island, I've always had a soft spot for Iceland who are now very much in a golden age of soccer. Unfortunately from a Canadian perspective, the team they played are not the true Icelandic National Team, and while Canada's team in Orlando could be called a "B" team, the Iceland team even more so. Canada wasn't playing against Swansea's Gylfi Þór Sigurðsson or Italian Serie A midfielders Emil Hallfreðsson and Birkir Bjarnason, or the very formidable strike force of Ajax's Kolbeinn Sigþórsson and Real Socidad Alfreð Finnbogason. Outside of maybe Rúrik Gíslason and Columbus Crew’s new signing Kristinn Steindórsson, none of the players Canada recently played will be prominent Icelandic national team players. Even with these lineups the odds had both teams even, justifiably so, and the results were as expected. From my work during the 2014 soccer season I covered the careers of 40,000 pro players and over 10,000 amateurs. If I was going to rank them, most Canadian national team players would be at such high numbers most casual soccer fans would be surprised that there is that many players in the world. My first comment regarding the game is no one really knows, myself included, how massive the game of soccer in the world really is. In my recent article regarding Sebastian Giovinco, I was destroyed on social media for comparing MLS defenders to the Azerbaijan national team, which I thought sincerely was a fair analysis, opposed to how he performed against France or Germany. The truth is no one really knows the standard of the Azebaijan National Team compared to MLS, and the same would be said if I showed a highlight real if available of how Giovinco performed against Iceland. Canada soccer has plenty of room for growth and I urge people to listen to the recent "From the Black Hole" podcast because I thought there were a number of good points brought up during that conversation. Almost two years ago when Canada lost a similar series to Denmark I wrote a column with suggestions on how the team could win these one off games. However, I have seen little evidence any of my suggestions are in place, and if I contacted the CSA about it I have feeling from past experience they would just ignore me. In this regard, Canada is at fault for their current and past failures and anyone who is upset or frustrated with them deserves to be so. 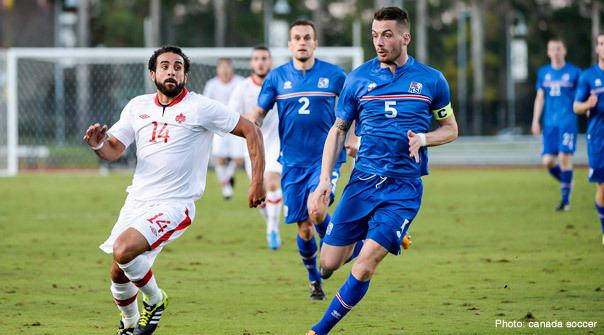 This being said, soccer in Canada is at its greatest influence as it has ever been in its history. As well, in many ways the Iceland national league reminds me of League One Ontario. If League One Ontario, under its current structure and mandate, was 100 years old I am confident we wouldn't be worried about losing games against a Iceland "B" team or qualifying for the World Cup. As I have said many times, we are responsible for the success or failures of soccer in Canada and it is up to us to understand the game and put plans in place to allow us to succeed. I see Iceland as a beacon of hope, that a country with a population the size of London, Ontario, or for the guys from the Black Hole a third of Saskatchewan, has been able to achieve what they have to date. The one thing Canada can take from these games against Iceland is that it's not about making excuses about why we are not successful, it's about making things happen.